Relaxing in a hot tub is so much more than a warm bath. It’s stress relief, quite time and a great massage wrapped up in one! When you spend time in your spa, you reap the benefits of hot tub hydrotherapy. This combines heat, buoyancy and massage to relax your muscles, increase circulation and help relieve pain and tension. Soaking in a hot tub before going to bed can lead to a deeper and more peaceful sleep. Millions of Americans suffer from sleep disorders, like insomnia, more than one night a week. Plus, a lack of sleep often leaves you feeling nervous, groggy and depressed or can cause erratic mood swings. Experts believe insomnia can be traced to hectic, stressful lifestyles, thus, relaxing in a spa regularly can help. A drop in body temperature can also aid in easing the body into a relaxing and sound sleep. Take a 15-minute soak in a hot tub about two hours before bedtime, and your body temperature can drop to enable a better nights sleep naturally without the grogginess sometimes caused by prescription remedies. For more information on the health benefits of hot tubs, visit the National Sleep Foundation’s website. Are you one of the 46 million Americans affected by arthritis? If so, soaking in your Hot Spring spa can help ease your pain. Joint inflammation from arthritis causes swelling, pain and stiffness, often resulting in the loss of joint movement or function. Immersion in warm water produces hydrostatic pressure on the body that results in reduced joint inflammation and increased mobility. Spas give you the soothing warm water and buoyancy needed to release tension and improve your quality of life. The use of hot water or heat is recommended for many people with arthritis but not all. Please consult your physician. For more information regarding arthritis and hot tubs, visit the Arthritis Foundation website. It’s been said that a family that spas together stays together. 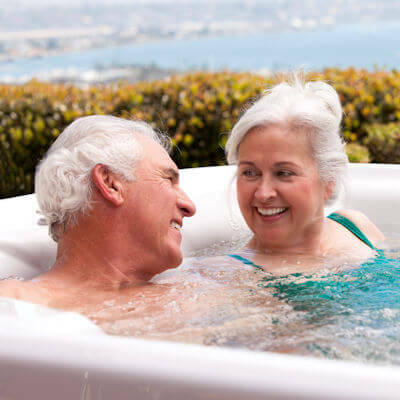 Whether you’re enjoying couple time in your hot tub or soaking with young children or teenagers, a hot tub is the perfect place to unwind and stay connected. Spend time in your spa as a family without the distractions of TV, Internet and cell phones. You might be surprised at how much talking is done allowing you to connect and understand one another. You can feel your best in a hot tub, while it offers you every-day physical and emotional benefits. In addition to providing stress-relief and relaxation, discover how a hot tub helps you enjoy time outside with loved ones!